New Zealand’s national women’s cricket side is already through to the 2017 ICC Women’s World Cup, starting in England in June. 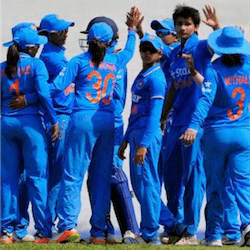 Nevertheless, the ICC Women’s World Cup Qualifier 2017, which finished on Tuesday in Colombo, Sri Lanka, was an opportunity for betting fans to check out prospective competition, while punting on some hard-fought matches at the same time. In the end, though, the teams finished in much the same order as they were ranked going into the competition. The Super Six remained identical, save for Sri Lanka managing to swop fourth place for third over Pakistan. The teams finished the pool stages in the same order as their world ODI rankings. India was undefeated at the top of Pool A, followed by Sri Lanka and Ireland. Zimbabwe managed just one win, against Thailand, who suffered a four-match whitewash. Pool B was much the same story: South Africa undefeated at the top of the pool, followed by Pakistan and Bangladesh, with Scotland on a single win and Papua New Guinea whitewashed. In the Super Six stage, hosts Sri Lanka provided an upset, beating Pakistan by 3 wickets in the 48th over of the first match. Pakistan’s disastrous 67 all out against India, which the top-ranked team eclipsed in just 22 overs and 3 balls, was what allowed Sri Lanka to pass Pakistan on the table, although both still finished in the Top Four. However, India and South Africa retained first and second place on the Super Six ladder, so they went through to the final. In the final on Tuesday, South Africa fell two balls short of the full 50 overs, ending at 244 all out. After 43 overs, it looked like India had it wrapped up at 4/209. But when the favourites lost four wickets in two overs for just 14 runs, the match was up for grabs. It eventually went right down to the wire, with India requiring 8 runs off the last two balls of the final over to win. Harmanpreet Kaur was up to the task, smacking a six and then taking two off the last ball. India, South Africa, Sri Lanka and Pakistan will now join England, New Zealand, Australia and the West Indies at the ICC Women’s Cricket World Cup in June.